Is something in the water at the Detroit Free Press? In three stories mentioning me over two weeks, two Free Press “reporters” fabricated and the third gratuitously insulted me in a non-opinion piece. The worst of these offenders is Detroit Free Press fabricator Kathy Gray (the paper’s “star” local political “reporter”). In the past, we’ve exposed Detroit News fabricator David Shepardson, who made up a whole story about an accused terrorist’s deportation. But Gray has now established herself as his equal. In a Friday story about election recounts (a recount has been requested in the Detroit Mayoral race), Kathy Gray “wrote” (actually pulled “facts” out of her rear end) about the recount in my 1990 race for the Michigan House of Representatives, in which I lost by one vote. Problem is, Gray was apparently too lazy to actually do some real reporting and find out the facts. So, she made them up. (It’s particularly obnoxious because she “wrote” about my recount in 1990 for another paper. Well, at least, she’s consistent, since she similarly fabricated and made up stuff when she covered my 1998 race.) If there was any doubt that liberal, mainstream media reporters with an agenda, like Gray, are liars, this is the ironclad evidence. 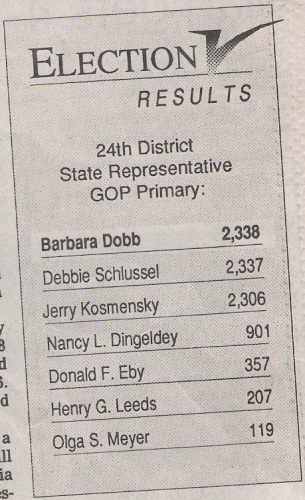 Barbara Dobb of Commerce Township was one of three Republicans who ran for state representative in her district in 1990. DEBBIE SCHLUSSEL: WRONG. THERE WERE SEVEN REPUBLICANS IN THE RACE. She won by one vote over Debbie Schlussel and Gerald Komenski was only about 100 votes behind the two leaders. DEBBIE SCHLUSSEL: WRONG–TWO FABRICATIONS BY GRAY HERE: THE GUY’S NAME IS KOSMENSKY, AND HE WAS 31 AND 32 VOTES BEHIND, a much closer number, which is significant in a recount. But the final tally didn’t change and Dobb was re-elected three more times after that first nail-biter. DEBBIE SCHLUSSEL: WRONG. THE TALLY DID CHANGE. WE EACH WENT UP A VOTE. Kathy Gray fabricated her “reporting” simply because she was too lazy to expend a few calories by typing in her computer and researching the race. When Free Press columnist Mitch Albom wrote a column, earlier this year, in which he wrote that some athletes attended an event that they did not end up attending, he was subject to a suspension and a thorough investigation. In this case, such an investigation is a heck of a lot more warranted. Albom’s error was not malicious and was in an opinion column. But this woman is the paper’s high-profile political “reporter”. Who knows what else Kathy Gray lied about/made up in the Detroit Free Press? She is probably in her fifties or beyond, and people’s dishonest habits start early in life, not in their old age. She’s likely engaged in this pattern of behavior all of her life. Since they looked up and verified every fact in every single thing written by Mitch Albom in the Free Press, the same thorough investigation is required for Gray, unless the Free Press practices gender and religious discrimination. Don’t hold your breath, though. I called her editor, Bob Campbell–who should go down, too. He did not fact-check her on any of the story or question why she reported an amount of votes as “about 100,” when there is no “about” on election tallies. It’s an exact number. He claims these fabrications are just “mistakes.” Wrong. Mistakes are when you make errors, accidentally report the wrong thing. Simply making stuff up because you don’t feel like doing actual reporting is deliberate, not a “mistake.” But instead of agreeing that Gray’s fabrication is disturbing, he had the gall to attack MY credibility. Hello . . . . I’m not the one who made up a story, Bob. And I’m also not the editor who looked the other way and now must do CYA, Bob. Ditto for his boss, Jeff Taylor, who told me that I don’t have the facts. Talk about chutzpah. The point of Gray’s article–that recounts don’t make a difference and shouldn’t happen (apparently, so Barbara Dobb can stop her M&M addiction)–is false when using the REAL facts in my race. In fact, many things were discovered that would have changed the results in my race, but for an unethical, conflicted (as in conflict of interest) judge–Edward Sosnick. Why DID liberal, pro-choice, gay-rights, NEA-endorsed Barbara Dobb go “through pounds and pounds of M&M’s [sic] during that recount”? And why is she against recounts where the race is close? * Several members of Dobb’s family voted in my district when they allegedly did not live there (her parents lived in Florida). Can you say “voter fraud”? In a one-vote race, that made the difference. My parents voted where they actually live, not in the district. * Several ballots were discovered that had not been counted but, under Michigan law, should have been, which were votes for me. * As we noted, the imperious, hypocritical judge, Edward Sosnick, got caught with his pants down. After he ignored Michigan law, even denying, among others, a Naval fighter pilot his right to have his vote for me counted, and declared her the winner, it came out that he represented Dobb as her criminal defense attorney when she embezzled from her job at a carpet store. But he hid it from everyone, then had the gall to lecture me when we discovered and complained about it. I was a 21-year-old kid who sacrificed and risked a lot to win a race because I believed in the system, but he and Dobb showed me how the system really “works.” So did fabricating “reporters” like Kathy Gray. And even 15 years later, she continues to “show” me. * Dobb shacked up with a convicted drug dealer, then wrote a letter of recommendation to get him a lenient sentence. * Dobb sued an ex-boyfriend in a psuedo-palimony/partnership lawsuit and got his house. He was a carpenter, but she claimed she built it. Right. * The ex-boyfriend and reliable sources told me about Dobb’s interesting, alleged arrest “record,” which they said primed her for the (political version of) prostitution she engaged in as a state legislator. Thankfully, she is gone from the Legislature (yes, term limits do work). But, unfortunately, fabricating “reporters” who don’t care about facts–like Kathy Gray–are still with us. Some things never change. What has changed is that now you know you can’t believe a lick of what she writes. Wow, one vote. Talk about suspicious, especially with all you mentioned above about conflict of interest.